Over the weekend, I attended HOPE X, the 10th Hackers on Planet Earth conference, organized by 2600 Magazine. HOPE is my favorite hacker conference, and a strong contender for my favorite conference overall, because although content is tech-heavy, it’s not really about technology. HOPE is a conference by and for those interested in the hacker ethos of free information, understanding the world, and empowerment to fix what is broken— including keynote speakers Edward Snowden and Daniel Ellsberg. So HOPE is a great place to think about the intersection of technology, journalism, and activism. Throughout the conference, I noticed several recurring themes. There was a strong push at HOPE to recognize that creating good technology was much more than just writing code. In Community Infrastructure for FOSS, James Vasile of OpenITP outlined a number of key components of successful software projects, from localization to user support. Quinn Norton called for secure software with user interfaces that are practical for everyone, not just those under NSA surveillance. Garrett Robinson of Mozilla with William Budington and Yan Zhu, both from the EFF, presented the progress they’ve made on SecureDrop a tool to allow whistleblowers to communicate securely with journalists, with a strong focus on ease of use. Centralized hierarchies have played a huge role in both human society and technology, exemplified by vertically-integrated, multinational corporations. But central authorities have many downsides, and new technology is enabling organization without centralization. Kevin Carter, Peter Valdez, and Kurt Snieckus of #nycmeshnet gave a talk about how they’re connecting New York to a global, peer-to-peer, wireless mesh network. Money geek Finn Brunton talked about Hacking Money, contrasting the decentralized nature of crypto-currencies to the historically centralized monetary system. There were two talks on communities creating their own cellular phone networks, one at Burning Man by Willow Brugh and Johnny Diggz of Geeks Without Bounds, and another in rural Mexico by Maka Muñoz and Peter Bloom. A talk on The Repair Movement discussed ways that people are fixing their belongings as an alternative to replacing them with affordable, mass-produced goods. In a conversation with Edward Snowden, Daniel Ellsberg pleaded for everyone to act when they see something wrong, rather than relying on a few, high-profile whistleblowers. Snowden suggested that even those who aren’t whistleblowers can work to create environments and tools to make it safer for those who are. Talk after talk gave examples of laws in the U.S. being stretched and misused. Daniel Ellsberg’s keynote centered largely on the Espionage Act’s shift from a seldom-used tool to defend against foreign spies, to an increasingly common tool to persecute journalists and whistleblowers. Similarly, Nicholas Merrill of Calyx and Ladar Levison of Lavabit chatted with Declan McCullagh about how laws meant for plain phone lines like CALEA are being used to justify email surveillance, and how ISPs can protect their users. 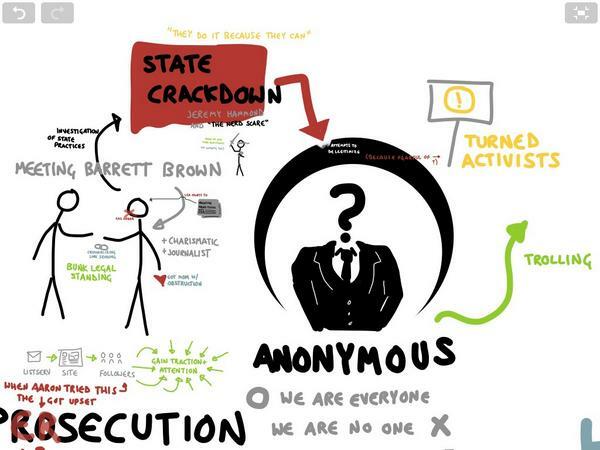 Kevin Ghallagher, Ahmed Ghappour, and Gabriella Coleman told the story of Barrett Brown, a journalist arrested and currently incarcerated for reporting documents others had leaked. In Bless the Cops, and Keep Them Far Away From Us, Alex Muentz gave some practical (and entertaining) advice on how journalists and hackers can avoid legal troubles. The EFF has been fighting abuses of the law in the courts, and gave an update on what they’ve been up to. The difficulty of making the tech community more inclusive came up in both the Diversity in Tech Meet-Up and the Hackerspace Community Dynamics Meet-Up. A common challenge was mitigating harmful behavior from members while maintaining an inclusive attitude. In her talk, Quinn Norton pointed out, to much applause, that hackers would have to improve their manners in order to increase adoption of security tools. A number of speakers cautioned about the dangers of perfectionism, and pointed out that sometimes a “good enough” solution is better than none, or one that’s hard to use. Conversely, there was a large push from the community to start performing better security audits on open source software in order to catch bugs when they exist. Heartbleed was a common example of how the “given enough eyeballs, all bugs are shallow” philosophy is not working well enough, especially for security issues. A lot of the topics at HOPE were pretty heavy. Yan Zhu quipped “We Call the Conference HOPE because there’s none in the talks.” But it was clear that the community is skillful at using fun and humor to maintain optimism, as well as to engage with others. I asked James Vasile how you can motivate volunteers on a large project when the rewards aren’t immediate and the work isn’t glorious. He responded that fun is a great motivator. There were talks about artists and satirists raising awareness about surveillance. Jason Scott told the tale of the DeCSS case, a long, grueling legal ordeal, and had the audience laughing the whole way. Playfulness has long been another part of the hacker ethos, and I was glad to see it alive and well. Of course, the overall theme of the event was that technology can help make the world a better place, and all of the nitty-gritty details of how people are actually doing it. Ellsberg ended his keynote by talking about the hundreds of thousands of lives that have been saved by the whistleblowers from the tobacco industry who revealed the dangers of cigarettes. He reminded us that information activism, and tools that support it, can save even more lives than that.